BEIJING — China is closing off a part of the South China Sea for military exercises this week, the government said Monday, days after an international tribunal ruled against Beijing's claim to ownership of virtually the entire strategic waterway. Hainan's maritime administration said an area southeast of the island province would be closed from Monday to Thursday, but gave no details about the nature of the exercises. The navy and Defense Ministry had no immediate comment. Six governments claim territory in the South China Sea, although the area where the Chinese naval exercises are being held is not considered a particular hotspot. China's navy and coast guard operate extensively throughout the South China Sea and regularly stage live firing exercises in the area. The announcement of the drills came in the middle of a three-day visit to China by the U.S. Navy's top admiral, Chief of Naval Operations Adm. John Richardson, to discuss the South China Sea dispute and ways to boost interactions between the two militaries. 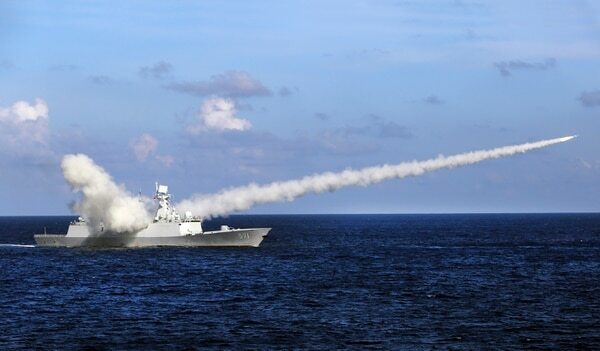 Chinese missile frigate Yuncheng launches an anti-ship missile during a military exercise in the waters near south China's Hainan Island and Paracel Islands in an undated file photo. 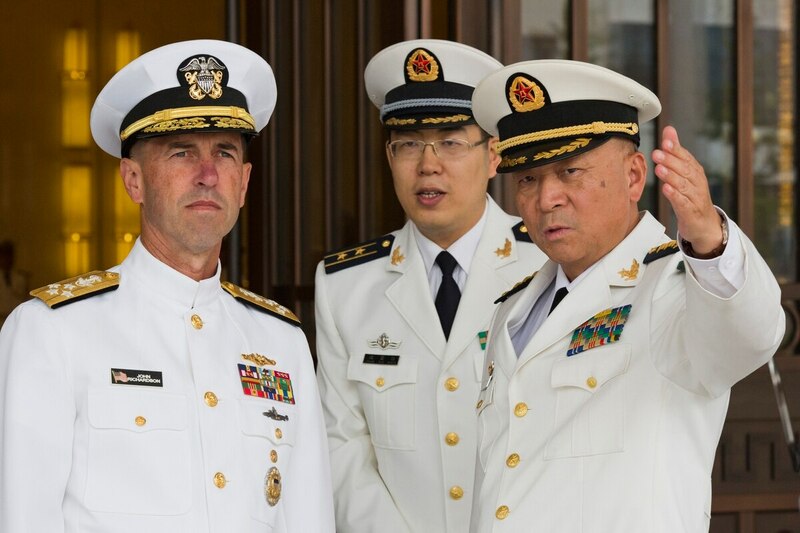 Although the tribunal's ruling was likely to be raised in Richardson's discussions, the head of the Chinese navy, Adm. Wu Shengli, did not mention it directly in opening remarks before reporters at a meeting Monday between the two men at navy headquarters in Beijing. State broadcaster CCTV later reported that Wu reiterated China's determination to defend all of its territorial claims in the South China Sea and would not permit its interests to be infringed on, a standard position for Chinese officials. China rejected last Tuesday's ruling by the Hague-based Permanent Court of Arbitration in a case initiated by the Philippines, and refused to take part in the arbitration. It asserts that islands in the South China Sea are "China's inherent territory," and says it could declare an air defense identification zone over the waters if it felt threatened. In the days following the ruling, Beijing landed two civilian aircraft on new airstrips on disputed Mischief and Subi reefs and dispatched its coast guard to block Philippine fishing boats from a contested shoal. 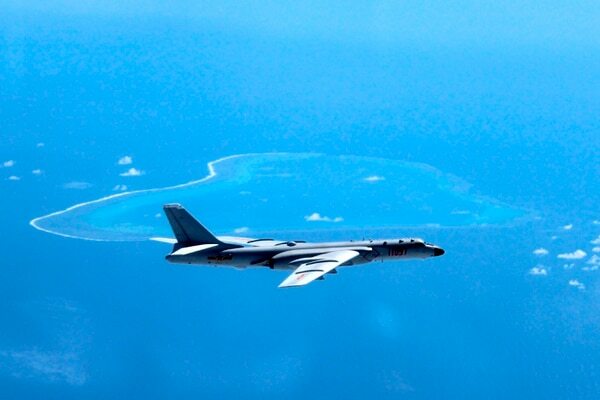 In a further development, Chinese air force spokesman Shen Jinke was quoted by state media as saying that air force fighters and bombers had recently conducted patrols over the South China Sea and would make that "a regular practice" in future. The tribunal ruled that China violated international maritime law by building up artificial islands in the South China Sea that destroyed coral reefs, and by disrupting fishing and oil exploration. China's island development has inflamed regional tensions, with many fearing that Beijing will use the construction of new islands complete with airfields and military facilities to extend its military reach and perhaps try to restrict navigation. Several times in the past year, U.S. warships have deliberately sailed close to one of those islands to exercise freedom of navigation and challenge the claims. In response, China has deployed fighter jets and ships to track and warn off the American ships, and accused the U.S. of threatening its national security.